I somehow ended up with 3 open containers of cocoa in my pantry and I was looking for a recipe to use up some of it. I found a brownie recipe at Epecurious.com that looked interesting and I did a little fiddling. (I’ll bet you’re not surprised.) The result is rich, decadent cocoa brownies that will satisfy anyone’s chocolate craving. 1. Preheat oven to 325° F. Spray an 8 inch square pan with cooking spray and set aside. 2. In a bowl, stir together the melted butter, the white and brown sugars, and the cocoa. Add eggs one at a time and beat after each addition until eggs are well incorporated. Stir in the vanilla and salt. 3. Add flour and stir just until the flour is incorporated. Do not over beat. Stir in walnuts. Batter will thick. 4. Spread batter evenly in prepared 8 inch square baking pan and bake for approximately 30 to 35 minutes. I’m having an August 99¢ Sale! Click here to buy FALLING FOR A SINGLE MOM Bundle! 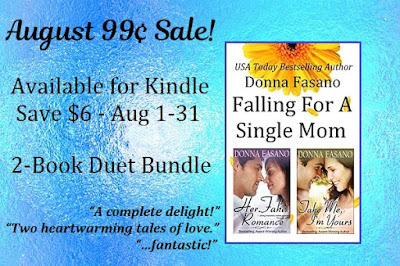 Labels: @DonnaFaz, August 99 cent Sale, Donna Fasano, Falling for a Single Mom, Rich Decadent Cocoa Brownies Recipe, What's for Dessert? Wow. I am so going to have to try that recipe. They look delicious. Thanks for sharing. 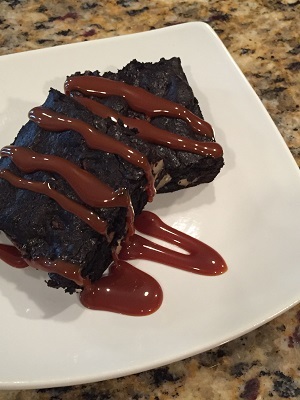 Thank you for the brownie recipe and the great sale, Donna. They both look delicious! My mother-in-law would love these brownies. She LOVES anything chocolate. Thanks for sharing. Sound so delicious. I love chocolate. Dang, I am out of eggs! I used the last of my over-ripe bananas, as a substitute for eggs, in a spice cake. They worked well, btw. I need to go grocery shopping. My car has been in the shop for over two weeks now, cause fender-bender. Hubby keeps putting off taking me. Thanks for the recipe, Donna! I'm a die-hard chocolate fan. My mouth is watering! Thank you for another way to satisfy my chocolate craving.